Only two people–both in opposition–spoke on the museum, office and events venue rezone put forward by prominent businessman and land owner Tony Townley. Carter did go along with a Planning and Code Enforcement staff condition on the rezone that could limit the size of the crowds at events Townley holds at the museum. The Board of Commissioners on Sept. 4 postponed action on the request by Lenru Properties LLC to modify the conditions of a business rezone (B-1) granted by the Commission in 2004. The modification significantly changed the size of buildings and layout of the development on the 7.5 acre tract. At that September meeting and public hearing, commissioners said they would not reopen the hearing when they met to make their decision. Tuesday night they allowed Guy Herring, director of county Planning and Code Enforcement, to summarize the issues with the rezone before voting. Herring focused almost exclusively on the 16 conditions the staff was recommending. Herring highlighted the proposed condition requiring the redesign of the intersection of Lenru Road and Malcom Bridge Road and the intersection of Malcom Bridge Road with the entrance to Malcom Bridge Middle School and the shopping center. For both intersections, the condition states that “In lieu of the required continuous travel lane for non-residential projects located on a corner lot, the developer shall install a traffic circle/roundabout or equivalent at the intersection. “Final design and location of such improvements shall be subject to review and approval by the Public Works Director,” it reads. The 2004 rezone did not require these roadway improvements, which will force Lenru Development to not only pay for the installation but also give up additional right of way as dictated by the Public Works director. “Illuminated and LED signage is prohibited,” another condition states. Service and delivery is prohibited from the Lenru Road entrance, and delivery, service and collection services are prohibited before 8:30 a.m., according to the submitted conditions. The original condition prohibited 30 types of businesses from the shopping center, including gas stations and convenience stores and fast food and take-out restaurants. The new conditions added 11 more exclusions, including variety stores, dollar stores and used merchandise stores. Commissioners spent only 1 minute and 40 seconds with discussion, with much of it focused on the how many conditions were involved if both sets were included. Gabriel Quintas, assistant director of Planning and Code Enforcement, presented the request by Townley Family Partnership LLLP to rezone 11.1 acres in the center of what formerly was the University of Georgia Plant Sciences Farm off Hog Mountain Road across from North Oconee High School. The land now is zoned for agriculture, and Townley was asking the county to rezone the property from A-1 (Agricultural District) to OIP (Office Institutional Professional District) so he can operate what is he calling the Eastville Car Museum, legally run businesses, and hold events at the site. An occupational tax certificate is commonly referred to as a business license. Quintas said Townley intends to continue using the office building for the administration of several businesses he owns and manages. 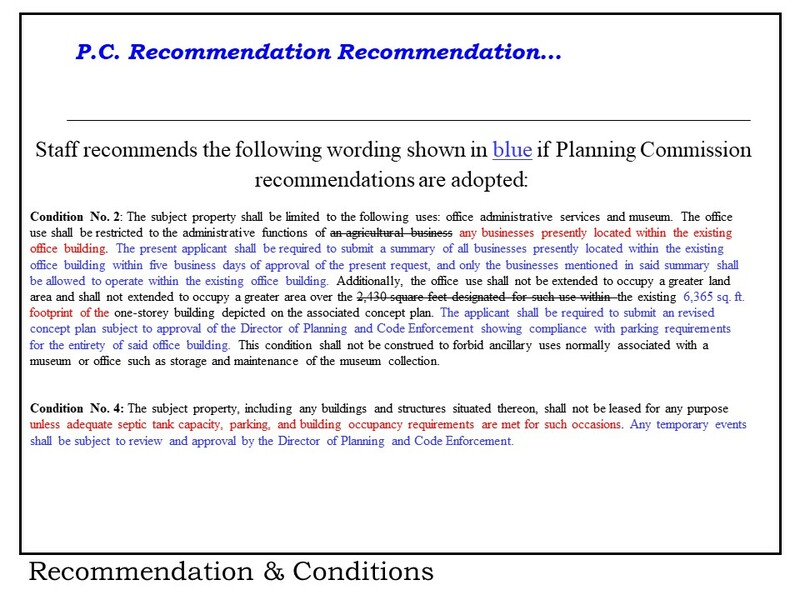 Quintas spelled out the conditions that staff had originally recommended for approval of the rezone, which would have limited the amount of office space to what is currently used by Townley and would have prohibited him from leasing the museum for special events. He then presented the changes to two conditions approved by the Planning Commission at its meeting on Sept. 17. The Planning Commission, which recommended 7-2 that the rezone be approved, removed the restrictions on use of the office for business purposes and the prohibition of use of the museum as an events venue. 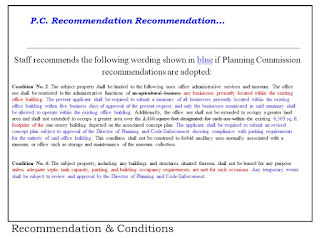 Quintas then presented a version of the two conditions passed by the Planning Commission that met with staff approval. The staff said Townley should be required to provide a list of all businesses presently using the office space and that future use of the building should be limited to those businesses and uses associated with the operation of the museum. Quintas said staff wanted to require Townley to submit a concept plan subject to approval showing compliance with parking requirements for the entirety of the office building. Carter, in the presentation that followed Quintas’, focused on renovations that Townley had made to the buildings on the property after he purchased it from the University and on the collections of signs, automobiles, and farm equipment now stored in those buildings. “We’re not planning on opening this up every day to start with. It is going to be somewhat driven by how many people come,” Carter said. Groups will be able to attend the museum “by appointment only,” he said. Carter asked the Board to approve the conditions recommended by the Planning Commission. Two people signed up to speak in favor of the proposal, but Carter did not save enough time for them to be able to do so. As was the case at the Planning Commission, Stephanie Dawson, 1461 Snows Mill Road, and her father-in-law, Dan Dawson, 2680 Lane Creek Road, spoke in opposition to the Townley proposal. She said the rezone should not be approved because of the noise, because of the increased traffic, because of the lack of adequate parking, and because of the threat of future commercial development. She said a crosswalk that will be painted on Snows Mill Road to connect the two properties that will make up the museum will be unsafe given the speed of traffic on the road. Dan Dawson said that he and his family own four parcels of land surrounded by property owned by Townley. His son operates six chicken houses on three of those parcels, and his son and daughter-in-law live on the fourth. Stephanie Dawson had told the Board that Townley recently built a bull pen that is “33 yards from my door” that has made her home nearly unliveable. “I deal with almost 20 bulls screaming all day long, all night long,” she said. Dan Dawson challenged Townley’s decision to clear land next to the house in which his son and daughter-in-law live and put in a bull pen. The location is a bad one for its purpose, he said, because of drainage problems. “I don’t understand the zoning things,” Dan Dawson said about the proposal before the Board. Discussion that followed the public hearing lasted only five minutes. Carter was asked if he accepted the two conditions as modified by the staff, and he said he did, with one exception. He said he did not want to have to seek approval from the director of Planning and Code Enforcement for every event held. Herring said the intent is to require a temporary permit for any event that “would max out their existing capacity on site.” At present, the property has 151 parking spaces, according to information provided to the Planning Commission. The Board approved the rezone with the modified conditions approved by the planning staff. Townley will be back before the Board at its meeting on Nov. 6 to ask for four variance waivers. Details of those requests are not yet public, but Quintas said they deal with a waiver of buffers, a waiver of requirements for sidewalks, and reduction of building setbacks. The Board also approved unanimously a request by Pinelake Campground LLC, 5630 High Shoals Road and Adams Road, to modify conditions for a Special Use for expansion of the campground set by the Board in May of 2017. Quintas told the Board that, during inspection of the site, staff had discovered that an earthen berm was being built instead of the masonry wall. The result was that Pinelake was asking for the change in the condition. Justin Greer, with W&A Engineering (formerly Williams and Associates), representing Pinelake, said the dirt for the berm came from grading the pond. The owner simply wants to use the extra dirt for a berm rather than build the masonry wall, he said. The Board spent seven minutes discussing how much dirt was available, why the request came after the berm was under construction, and whether the earthen berm could be extended along Adams Road. Greer said the dirt was only being stockpiled and would be hauled away if the request were not approved and that he didn’t know how much further the berm could be extended. The Board added a condition that required Pinelake to begin paying the county’s hotel/motel tax and voted unanimously for the substitution of the berm for the wall. The Board appointed Stephanie VanDyck, 1051 Glen Lane, off High Shoals Road, to a vacant spot on the Cultural Affairs and Tourism Committee. 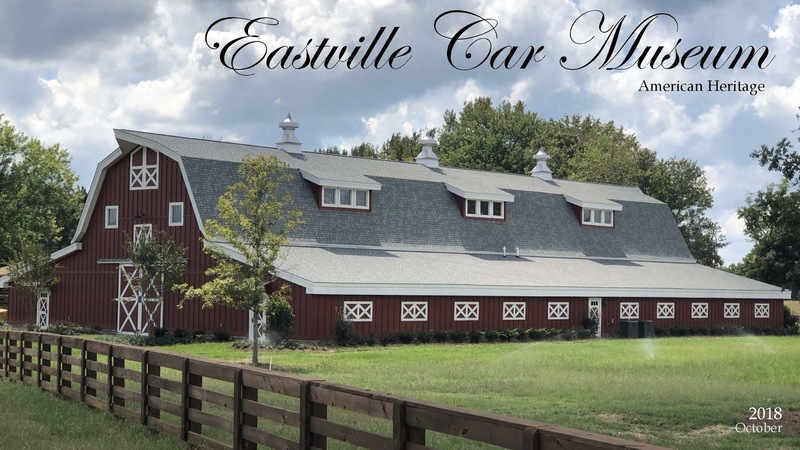 The Board reappointed Thomas Verner, 1190 St. Andrews Drive, off Meriweather Drive, to the Farmland Preservation Committee and appointed Thad Padgett, 1031 Twin Lakes Road, off Daniells Bridge Road, to that Committee. The Board reappointed Wayne Bagley, Matt Elder, Don Phillips, and Linda Porterfield as associate members of the Industrial Development Authority and added Chad Hargrove as a new associate member. Bagley lives at 5421 Hog Mountain Road; Elder lives at 1040 Oliver Bridge Road in the south of the county; Phillips lives at 1301 Brittain Estates outside Watkinsville; and Hargrove lives at 3130 Salem Road near Farmington. Porterfield did not list her address on her application. In a break with past practice, the Board did not interview the candidates at its agenda setting meeting last week, though it did make the decision on appointments in executive session following that meeting. Names of applicants were released publicly only on Friday, after the selection had been made. Justin Kirouac, county administrator, confirmed after the meeting that the Board had changed procedures but had not made any announcement of that change. The video below is of the entire Board of Commissioners meeting. The discussion of the Lenru Development rezone request begins at 4:30 in the video. Discussion of the Townley rezone request begins at 11:18 in the video. Discussion of the Pinelake Campground begins at 49:10 in the video. OCO: BOC 10 2 18 from Lee Becker on Vimeo. Tony Townley has taken the former UGA property and turned an ugly eyesore into a beautiful place. I truly believe that when his plans are completed, it will be a place that Oconee County can be proud of. In fact, I pass there every day and I have been proud for a long time to see the well-planned changes he has made. Can't wait to see the cars and other things. Thanks for giving him the zoning he needs. I'm assuming Commissioner Bubber Wilkes obviously & ethically recused himself from the Townley vote, correct?? And when you run unopposed, what happens to campaign contributions?? Wilkea did have a challenge in the primary. So receiving a campaign contribution make you automatically unqualified to make a decision? What would happen if someone donated to all of the commissioners campaigns? Has Townley cleaned up all of the buried wastes left by UGA Plant Sciences? If not, Will he be required to do so before constructing a public venue?